take these chances: what makes today. Today is different from all the rest. Do you know why? I'm running again :). 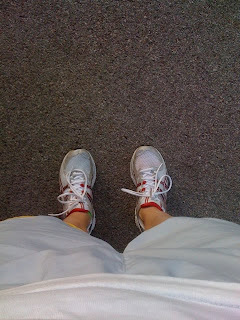 It felt good to put my running shoes back on and take them for a spin. It's funny, because you never forget how to run, but you can get out of your rhythm. It took me about 10 minutes to find my rhythm, but then it was like I had never been off. Also, I've been listening to new music. Check out Ingrid Michaelson's Everybody. Another new thing today, I'm cutting out Dr. Peppers. I would say sodas, but I don't drink sodas; I drink Dr. Peppers. Lots of them. Well they're out as of today. Water water water. I've been reading my friend Cary's blog this month for heart-healthy tips. You should check it out, too! I also made-over my blog. It needed "spring cleaning." Although, it's not spring yet, I'm highly anticipating its return. And daisies are so happy. Matthew 6:27-34 says, "Who of you by worrying can add a single hour to his life? And why do you worry about clothes? See how the lilies of the field grow. They do not labor or spin. Yet I tell you that not even Solomon in all his splendor was dressed like one of these. If that is how God clothes the grass of the field, which is here today and tomorrow is thrown into the fire, will he not much more clothe you, O you of little faith? So do not worry, saying, 'What shall we eat?' or 'What shall we drink?' or 'What shall we wear?' For the pagans run after all these things, and your heavenly Father knows that you need them. But seek first his kingdom and his righteousness, and all these things will be given to you as well. Therefore do not worry about tomorrow, for tomorrow will worry about itself. Each day has enough trouble of its own." I love that. My heavenly father knows what I need. So I can take these chances day by day. Run away from the Dr. Pepper!